Welcome to Saint Bonaventure! Whether you attend Mass regularly, are visiting from another parish or faith community, or if you’re looking to join or return to the Catholic Church, all are welcome. Please explore our website and visit us this weekend at Mass! Saint Bonaventure Catholic Parish is one of four Catholic Churches in Huntington Beach and has been here since 1965. Our Mission Statement: As Christian stewards, our mission is to proclaim the Gospel of Jesus Christ to all people through word, sacrament, service, and community life. Getting involved is a key part of our faith. We encourage all of our parishioners to be active members of our faith community, helping others, and sharing our faith. Check out the numerous ministries Saint Bonaventure has to offer. If you would like to become a registered member of Saint Bonaventure you can register here. If you’re curious about the Catholic Church or would like to become Catholic, we invite you to learn more about our faith. Visit Become a Catholic. 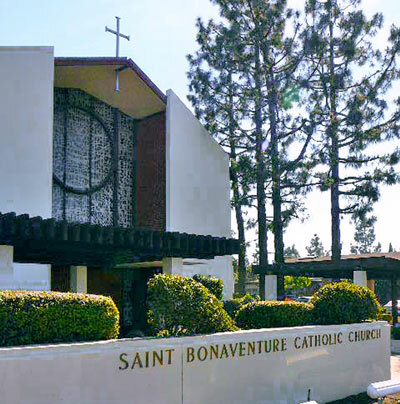 Monday – Thursday: 9:00 a.m.–5:00 p.m.
Saint Bonaventure is a Roman Catholic Church in Huntington Beach, California with a diverse and vibrant membership. Although we are a large parish, we strive to create small communities through our many ministries, encouraging everyone to get involved and be part of our church. Saint Bonaventure was established in 1965. You can read all about our history here. Therefore we make the most of our participation in Mass, especially on Sunday. It is here that the community gathers in prayer. It is here that we listen to the Word of God and we are nourished by our Lord, Jesus Christ in Holy Communion. At the end of Mass we are dismissed, that is, we are sent on a mission to spread the Good News of Jesus Christ to those we encounter. We can’t hold this inside; we have to share what we have received. This is why we have so many ministries at St. Bonaventure. They are our way of spreading the Good News within the parish and beyond our boundaries. You can find out more about our parish by touring the rest of our website. Please join us for Mass on Sundays and weekdays. Please consider joining one or more of our many ministries.